When it comes to custom-tailored GRP Storage Systems, HOBAS makes the seemingly impossible possible: in the Croatian parish of Pitomača, a 1000 m³ GRP potable water tank was installed in a record time of merely five days. The tank is the biggest of its kind ever produced by HOBAS Austria. It does not only provide a great lot of room for water, but also for profound technical know-how and a considerable number of advantages. Leak tightness, a very long service life, low maintenance, and flexible expandability: The reasons for the municipality of Pitomača and Hrvatske Vode, the Croatian entity for water management, to choose HOBAS Products for their potable water project were manifold. 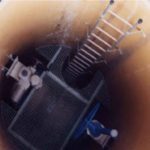 With highest quality, abrasion and corrosion resistance, and a lifetime of more than 150 years, the GRP solution offered by HOBAS was clearly on the winning side. HOBAS Austria designed and supplied a potable water tank with a capacity of 1000 m³ – the biggest ever produced by the organisation and also the biggest ever installed in this part of the world up to now. In efficient cooperation with Hidroprojekt-ing projektiranje d.o.o. and the constructor Brana d.o.o, six parallel pipelines and a valve chamber DN 2555 covering an area of roughly 19 x 39 m were installed within a record time of five days – the minimum installation time for a comparable concrete alternative would have been six months. And the installation time could have even been one or two days shorter, had it not been for the tank’s location: It was layed on a hill in a place inaccessible for big trucks. The pipe sections therefore had to be temporarily stored a few kilometers away from the installation site and then reloaded to smaller trucks that could manage the narrow, unpaved road uphill. The reliable and watertight HOBAS GRP Solution provides further significant advantages in terms of safety: With concrete, the risk of wall cracks due to ground settlement is relatively high and watertightness can therefore be a serious issue.